Keckley cast iron wafer body double disc check valves have pin retainer holes in the body where plugs are inserted to hold the hinge pin and stop pin in place. 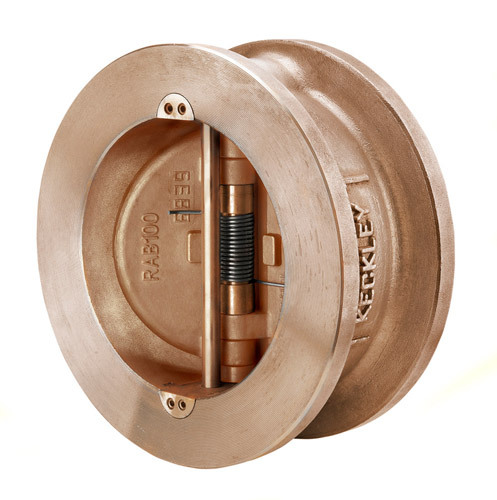 Keckley offers a retainerless wafer body design in bronze, carbon steel, stainless steel, and other specially cast alloys. The Keckley retainerless wafer body double disc check valve features a single cast body without pin retainer holes in the body. This design minimizes prospective leak paths through the valve body making it a preferable option for highly toxic, corrosive, or hazardous gas chemical processing applications. Keckley wafer body double disc check valves are also suitable for liquid, natural gas, steam service, and vacuum service applications. CONFIGURE YOUR WAFER BODY DOUBLE DISC CHECK VALVE. 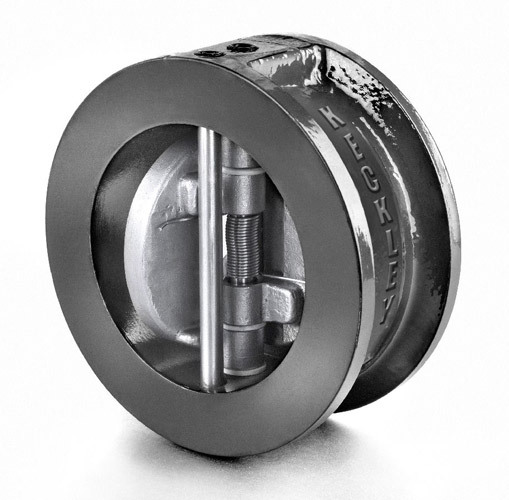 Keckley double disc check valves offer a short face-to-face dimension, are lighter in weight than full body check valves, and are double disc spring loaded to provide a low cracking pressure. The design of the tension spring performs a lifting motion on the disc to prevent excessive wear on the “heel” area of the elastomer seat. The independent, dual shaft design allows interchangeability of shafts. The stop shaft stabilizes the discs during high flow rates. Keckley wafer double disc check valves are used in both horizontal and vertical (upward) flow applications. For horizontal flow applications, the shaft should be vertically oriented to the pipeline. For vertical (upward) applications, the shaft should be perpendicular to the piping. Keckley double disc check valves are normally stocked and available to ship immediately with Buna-n, Viton, EPDM, and metal seats. The standard discs furnished in all units are stainless steel. Keckley double disc check valves are field serviceable without the need for special tools. Keckley double disc check valves are designed to ASME specifications and conform to API 594 & 6D. Keckley double disc check valves are tested to API 598 standards.